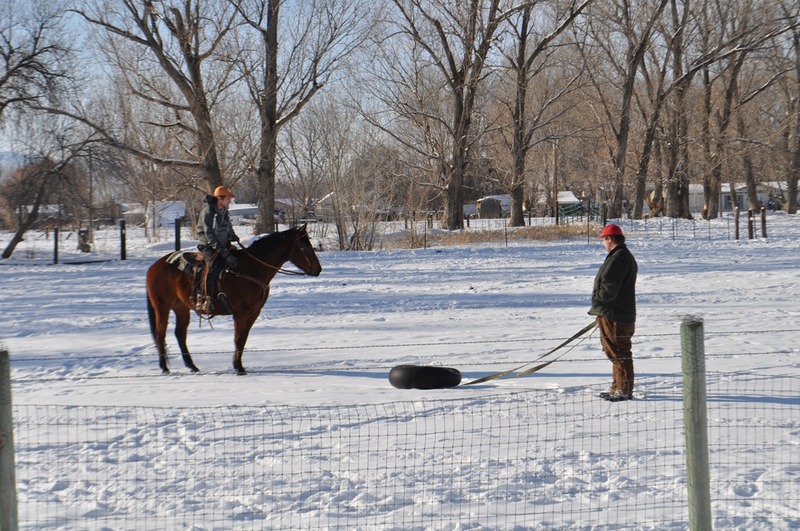 What do you do when you have an old snowboard in your shed, six horses on winter vacation and five acres of snow in your pasture- you go skijoring! 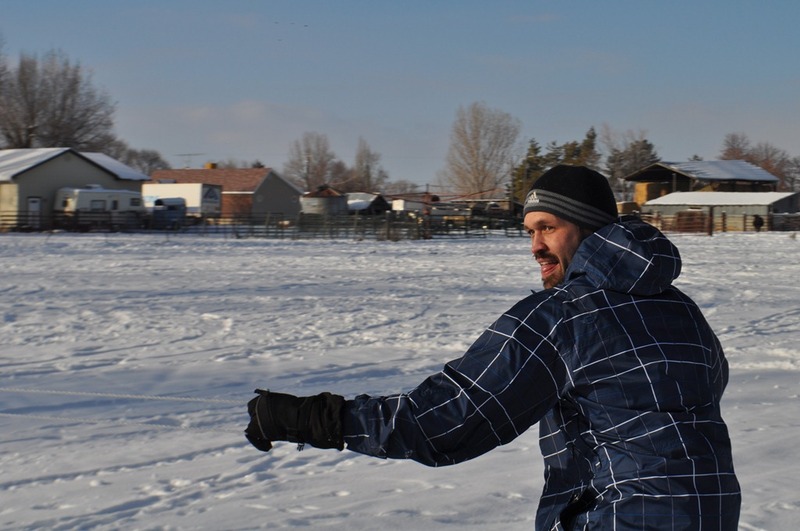 Skijoring is a winter sport that originated in Scandinavia. 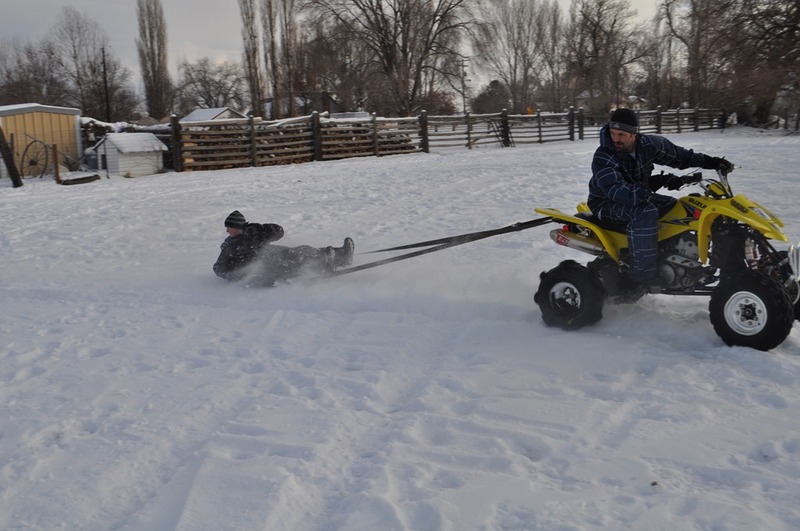 It involves towing a skier behind horses or dogs. Having to choose between horse power and dog power- we choose the horses. 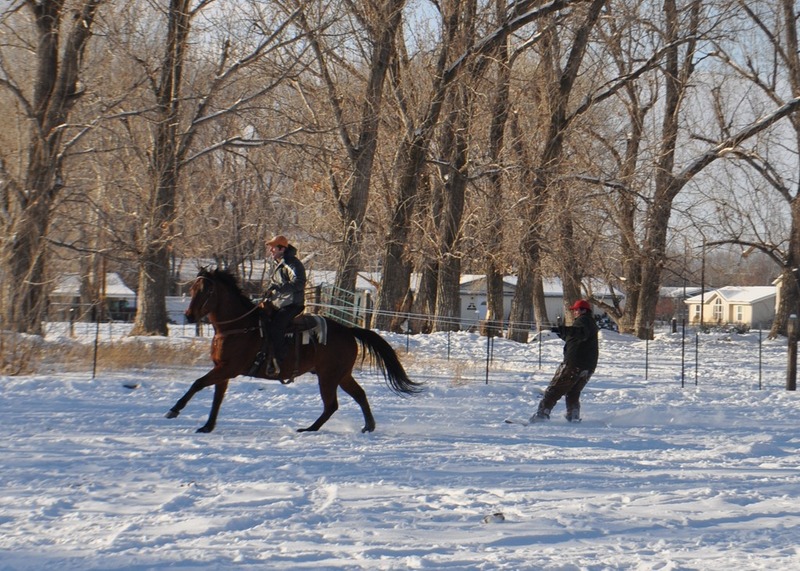 Horse skijoring usually takes two people and one horse. 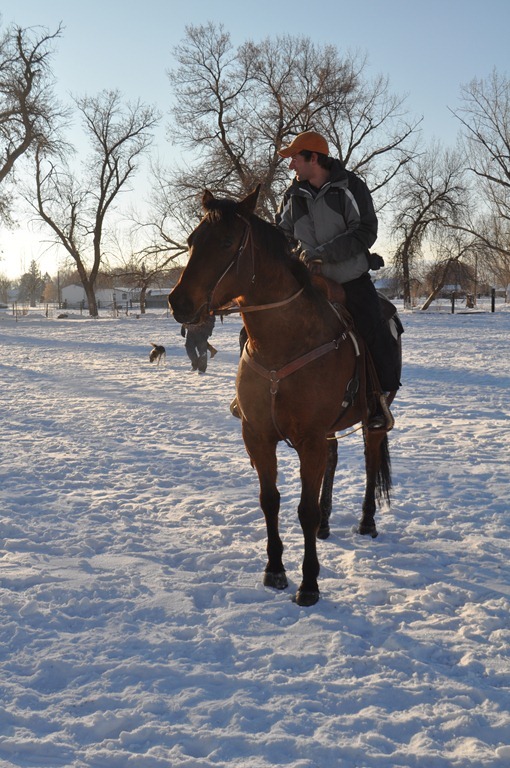 One person rides the horse while the skier is towed behind on skis or a snowboard. 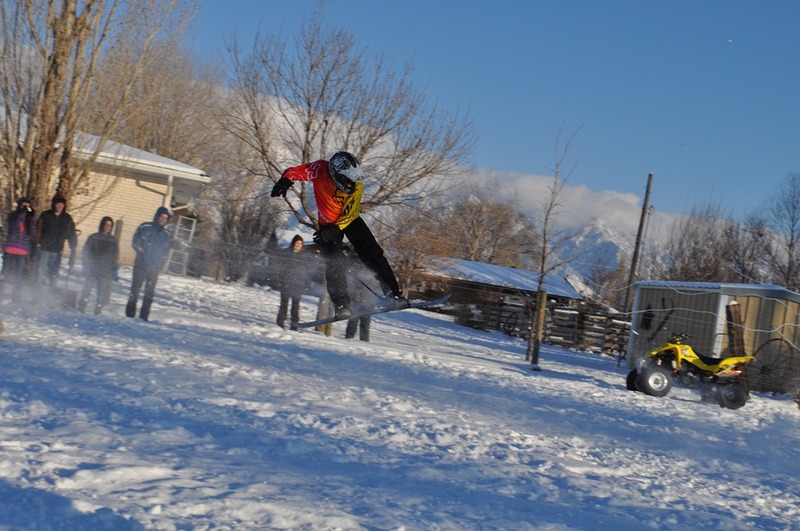 The rider determines how fast you go and the route, while the skier holds on and tries to maintain enough control to maneuver around obstacles or perhaps towards obstacles such as a jump. 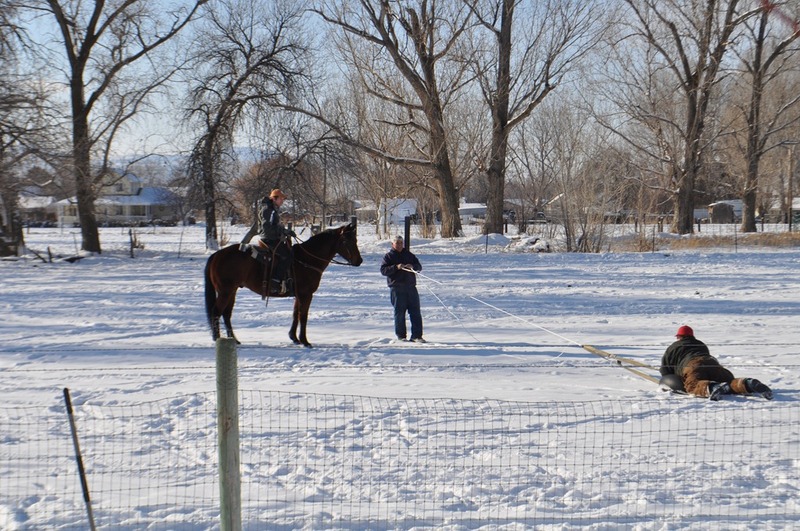 We saw a demonstration of horse skijoring at Ogden City’s Winter Fest a couple of years ago and have talked about giving it a try ever since, but this is the year we made it happen. We began slowly, beginning first with an inner tube. Our horse, Raleigh, wasn’t very excited about a black donut following behind him, but with some patience and encouragement he soon caught on so we took the next step- we added a live person! That didn’t seem to bother Raleigh so we strapped on the snowboard and that’s when the real skijoring began. 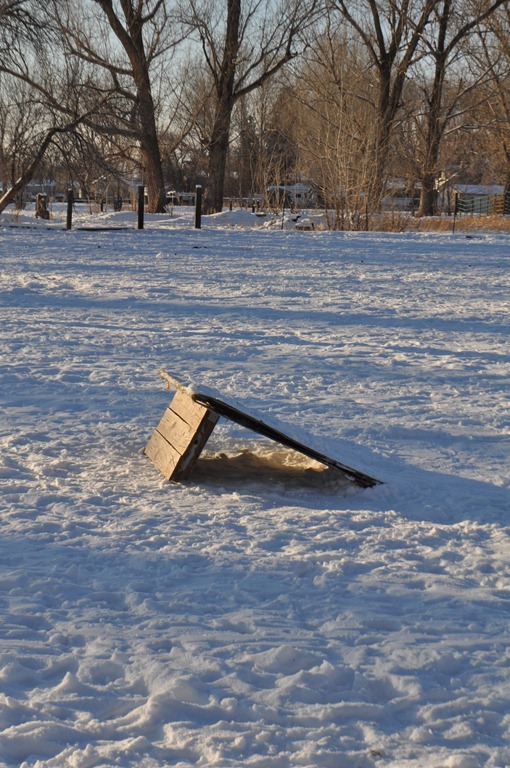 We used a light, nylon rope for our skijoring which worked fine but hope to snag a waterskiing rope before we go skijoring again- the handle would be much more comfortable. One thing we did discover was that when the horse made a turn the skier would be whipped around and would come right up to the side of the horse, very much like coming out of the wake when you are water skiing only a little more extreme. 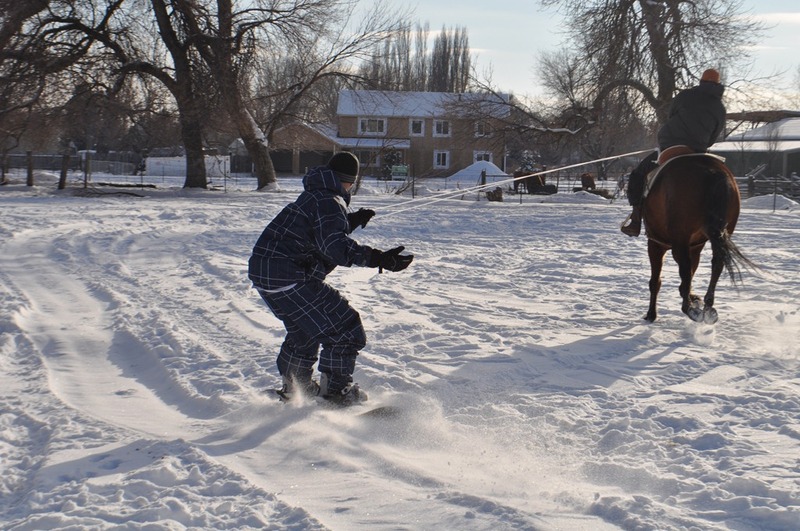 Our first attempt at Skijoring was so much fun we couldn’t wait to go at it again and this time we decided to add a jump. 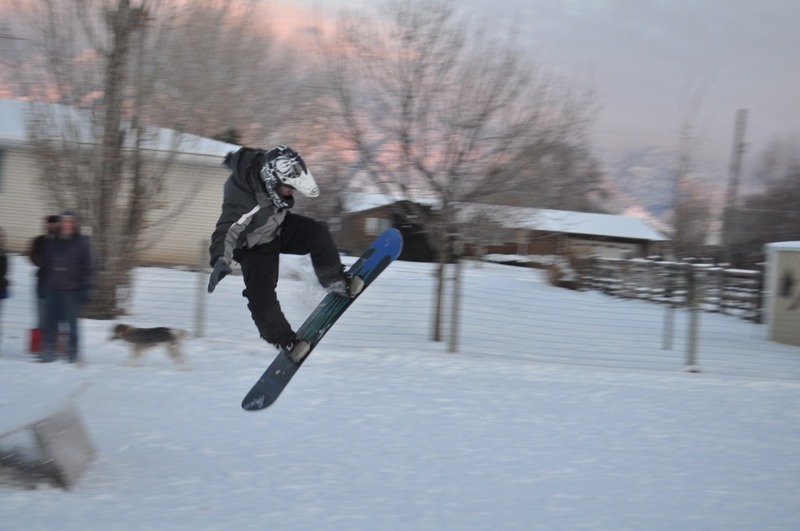 Even though it was a relatively small jump we did manage to get some air. 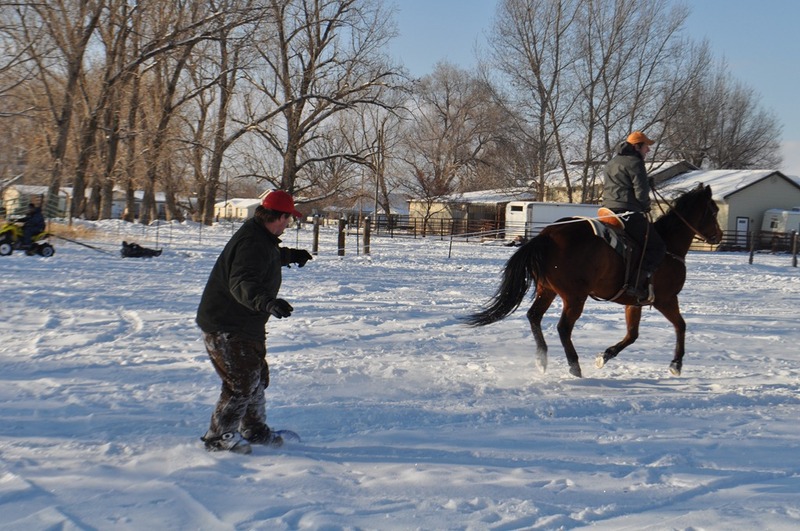 Although the humans did a great job at skijoring the true hero was Raleigh, our 8 year old bay Quarter horse who was thoroughly dried off and given an extra measure of oats at the end of the day. Because there were a lot of people that wanted to get into the action we kept the four-wheeler running with inner tubes in tow. When I do my family fun presentations I encourage families to “make the ordinary- extraordinary” and skijoring is a perfect example of that. All we did was took a look at what we had available to us and turned it into some extreme family fun. One last thing- “LIKE” us on Facebook to be eligible to win a FREE family reunion theme package! Like us HERE. 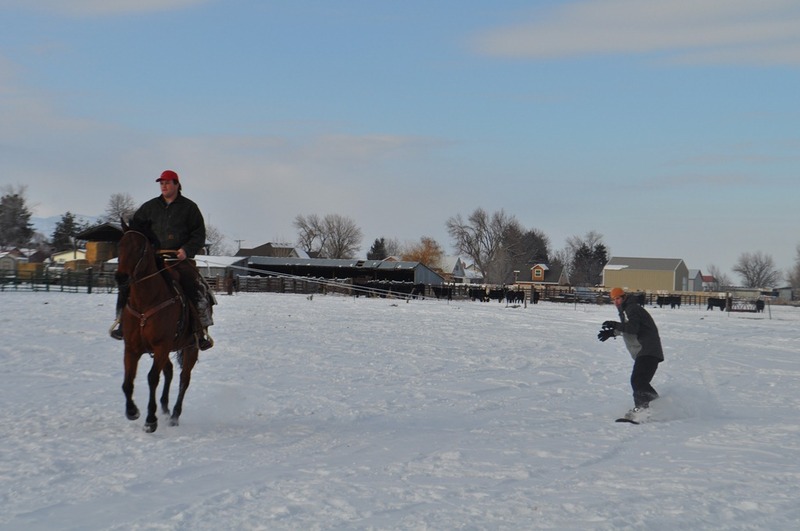 This entry was posted in Family Fun, Family Reunion Fun, Holiday Family Fun, Parties, Party Fun and tagged how to skijore, skijoring, skijoring how to, skijoring with horses, skijorring, winter family fun by Aunt Mo. Bookmark the permalink.